Glitter and Bonbons: StampNation LIVE! 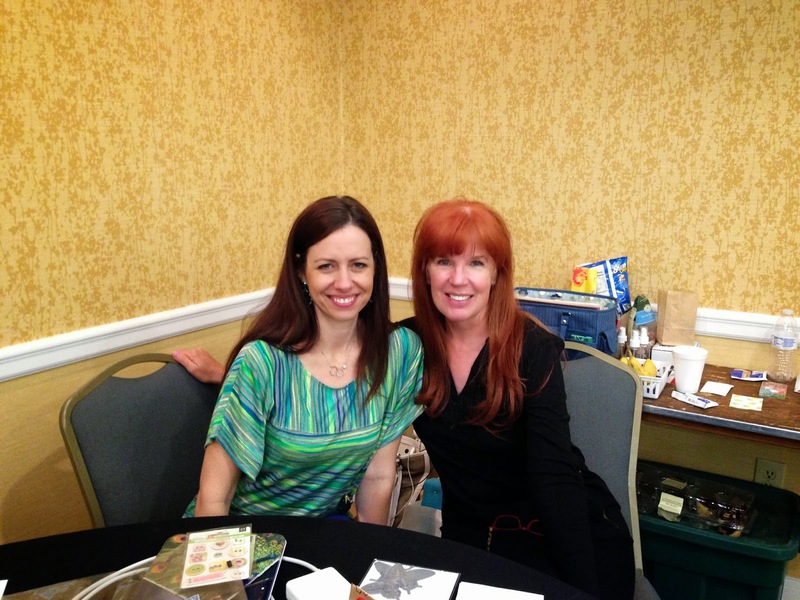 On Friday we reached our destination - the Second Annual StampNation LIVE Crafting Retreat in Raleigh, North Carolina hosted by the founder of StampNation, Catherine Pooler. We had, in a word, a FABULOUS time. Fine, it was three words, but suffice it to say I'm surprised I managed to take any pictures at all because there was so much going on. 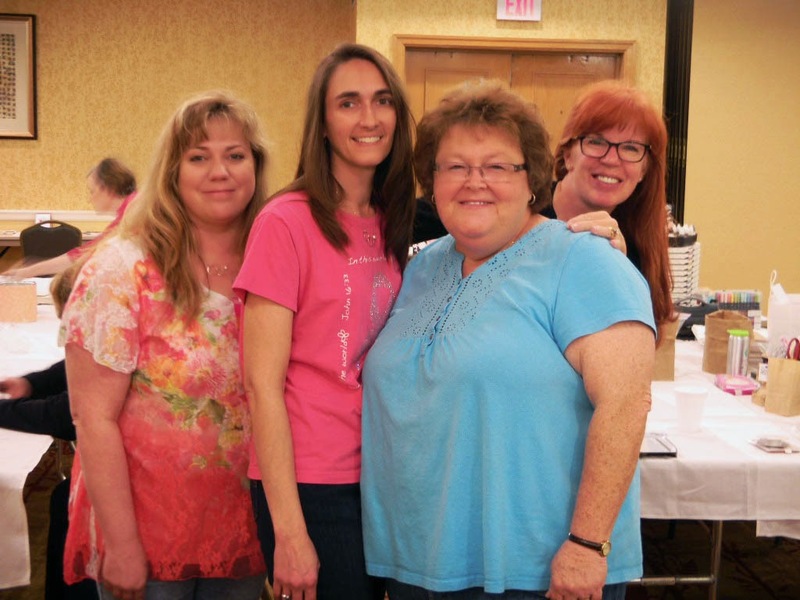 There were demonstrations of new products and new techniques by the lovely and talented Design Team, there were door prizes, there were lots and lots of freebies by the sponsors, and of course there was the main reason for going - the fellowship with the other crafters, many of whom I met at last year's retreat and know online through our subscription to StampNation! It was well worth the 2500 mile round trip, I promise. So without further ado, the rest of today's post will consist of just a few of the many pictures I managed to fit in. My lovely traveling companion. 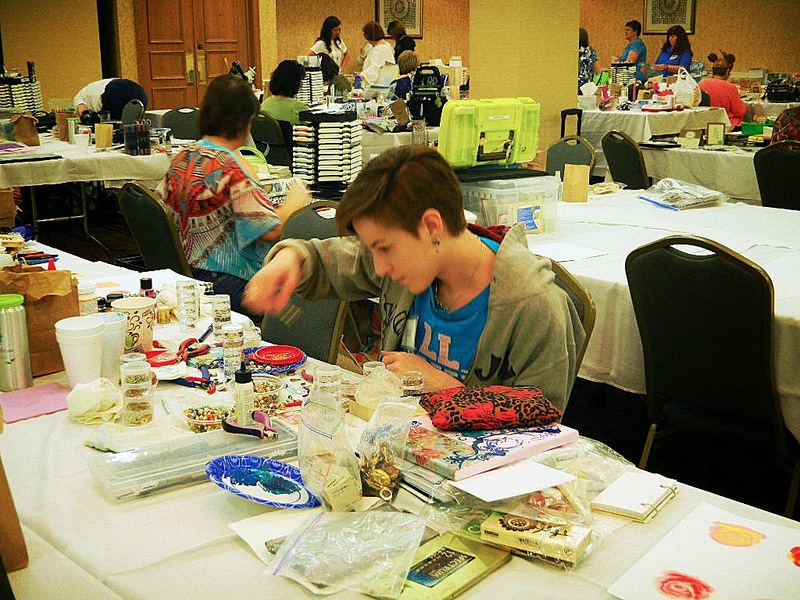 She didn't work on paper crafts, she brought her jewelry supplies and made things for our Etsy shop. Kristie, teaching a new (to us) Gelatos technique. Messy, but fun! 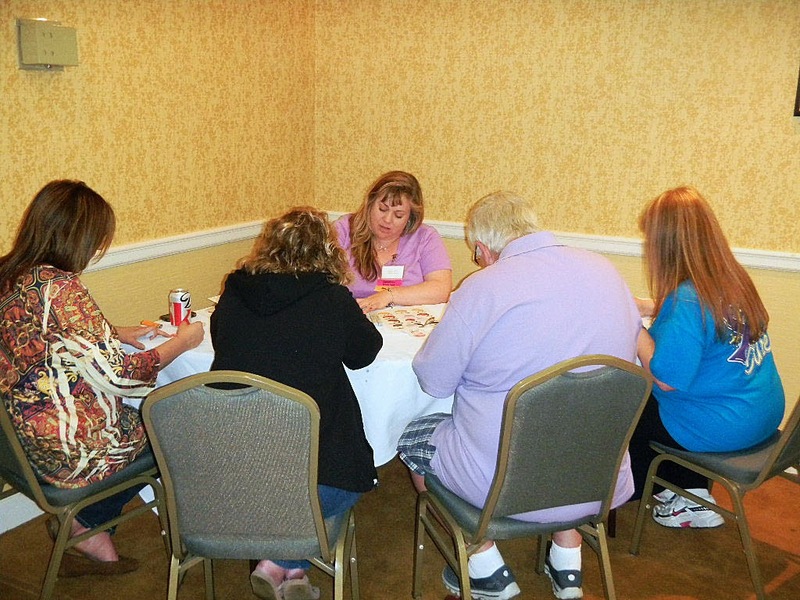 Maureen was working with several media including Distress Markers and Distress Paints. Yes, the lady on the left (Elaine) was wearing her blingy mouse ears. She had been to Disneyworld on her way to the retreat. This is Heather. I don't remember what she was teaching as I somehow missed this class. I do know there was lots of laughter in her corner of the room. She's a hoot with a fabulous sense of humor. 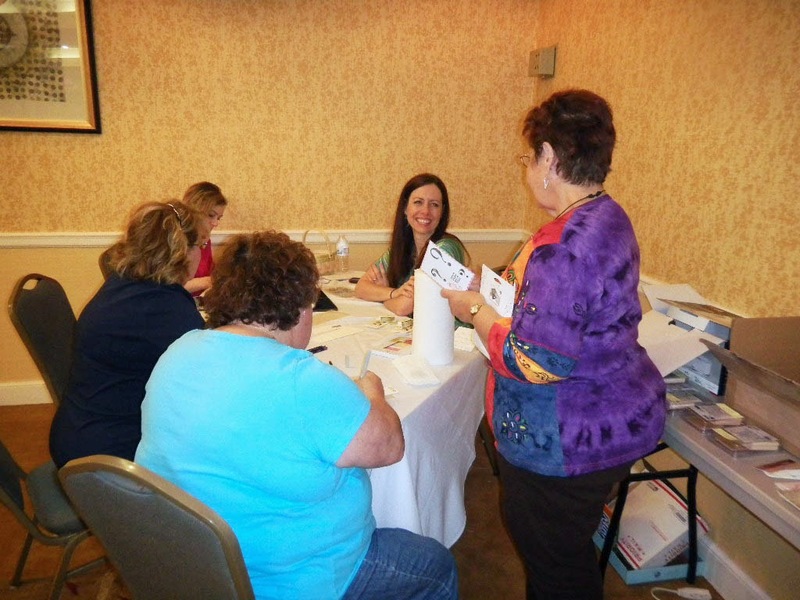 Our lovely Catherine Pooler, who was also teaching some crafty fun with Gelatos and embossing paste. Look at that smile - the woman can't take a bad picture! This was the project that I made and gave away in the free raffle on Sunday. 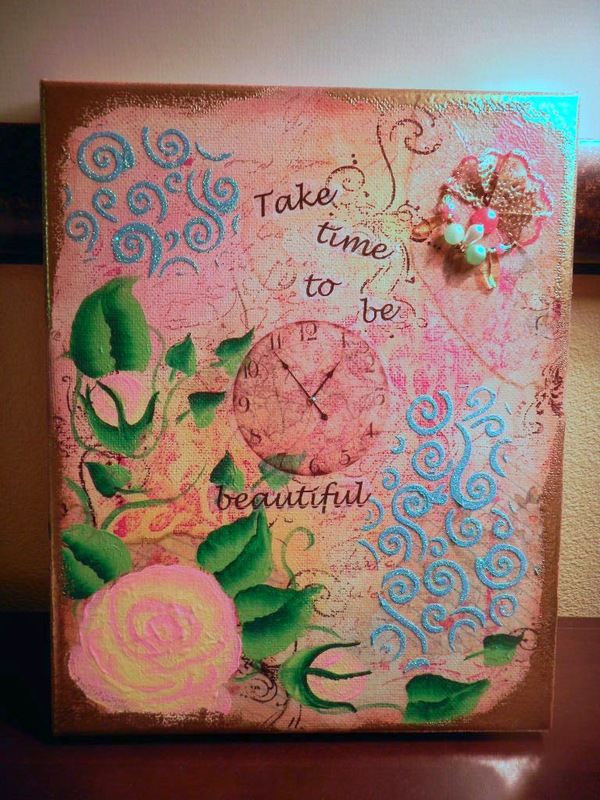 It's a canvas on which I stamped, decoupaged printed tissue, colored with Neocolors, stenciled (with colored gesso and then sprinkled with glitter), and hand painted. 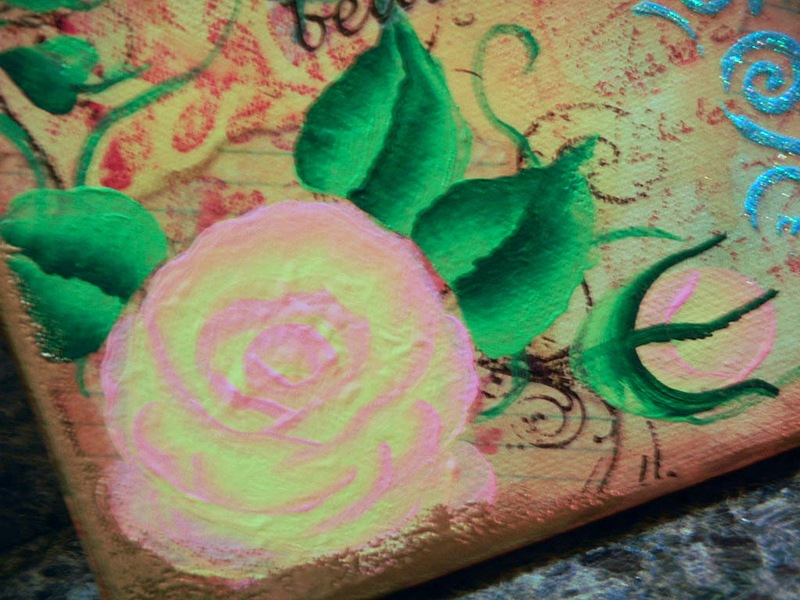 The rose was my very first painted rose for the public eye. Up until now I had just been practicing on paper at home. Sorry about the lack of clarity - my hotel room had awful lighting and this was as good as it got. The "bubbles" are because I painted it on tissue that had been decoupaged to the canvas. I always get bubbles when I use tissue for decoupage. Let's just say the rose is "textured." 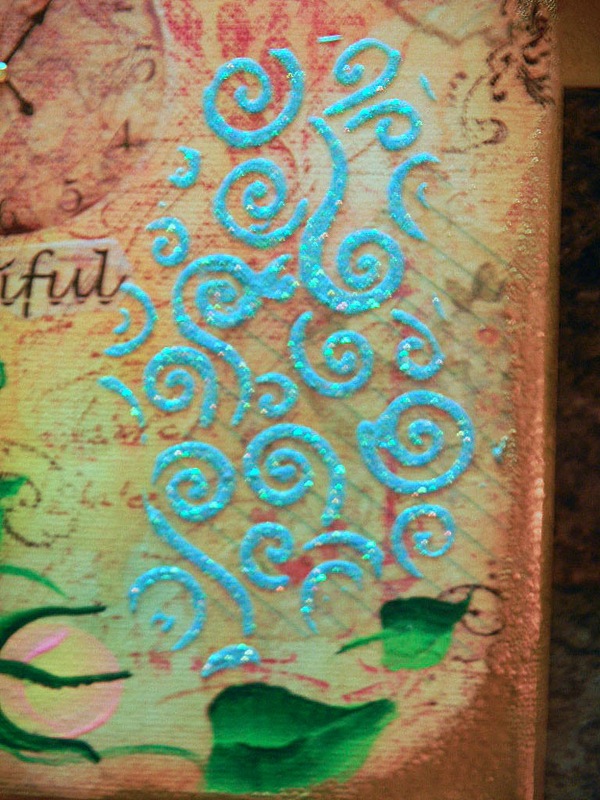 A close up of the glittery stenciled area. 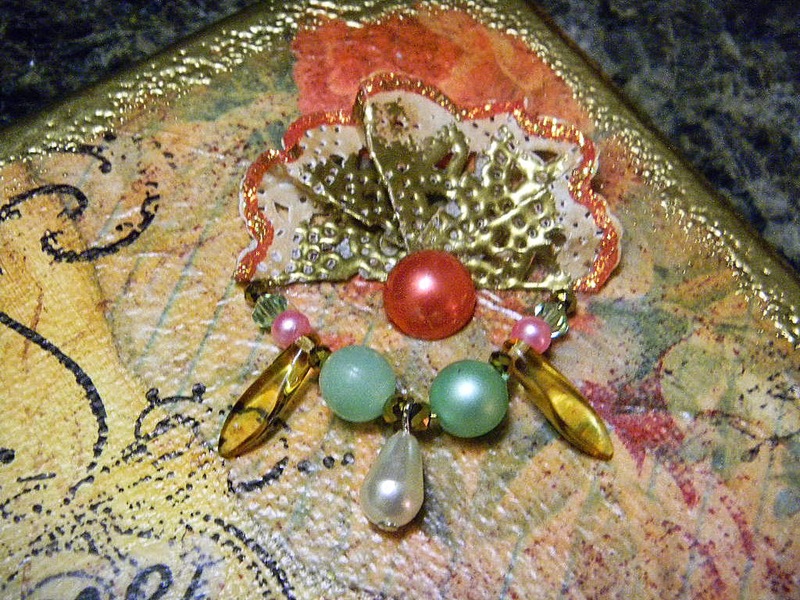 This was a little dangly that I made with some wire, a few of my daughter's beads, and a snippet of a paper doily which I had first inked, embossed in gold and applied glitter around the outer edge. A coral pearl centered it. 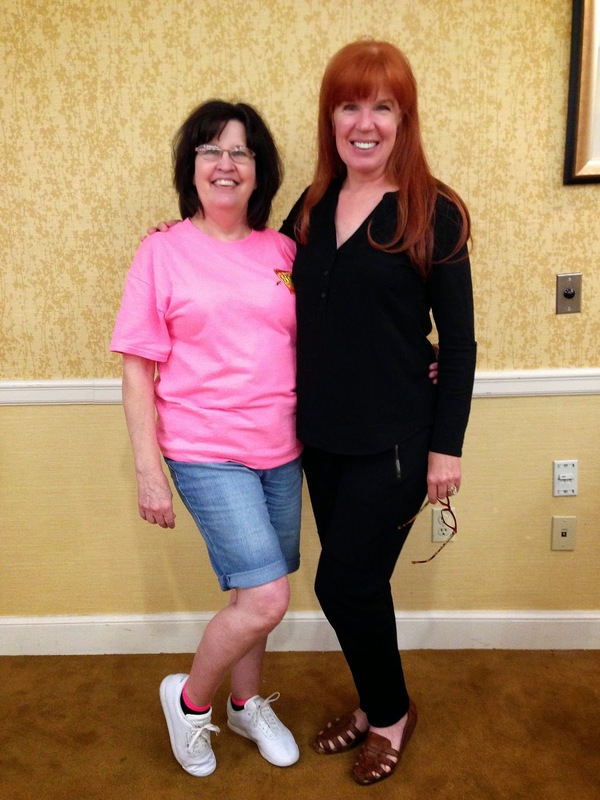 And our annual ham-it-up picture with my good buddy Kimie from Virginia. There were shenanigans before this picture was taken - this is our "ladylike" pose. Thank you so much for joining me on this week long vacation. The trip back was uneventful except for the fact that we outran the tornadoes that hit the Mississippi/Alabama areas. We drove through where Alabama was hit about 6 hours before the tornadoes started touching down, completely oblivious that storms were approaching. Thank goodness for guardian angels. Have a wonderful week - happy crafting! - To learn more about StampNation, go here. - Become a member right now, go here. FANTASTIC photos, Shea. Thanks so much for sharing. And you look fabulous, darling, simply fabulous!!! Your rose is great.What a wonderful job you did on your canvas. I'm glad you took a picture of it to share with us, before some lucky someone made off with it.